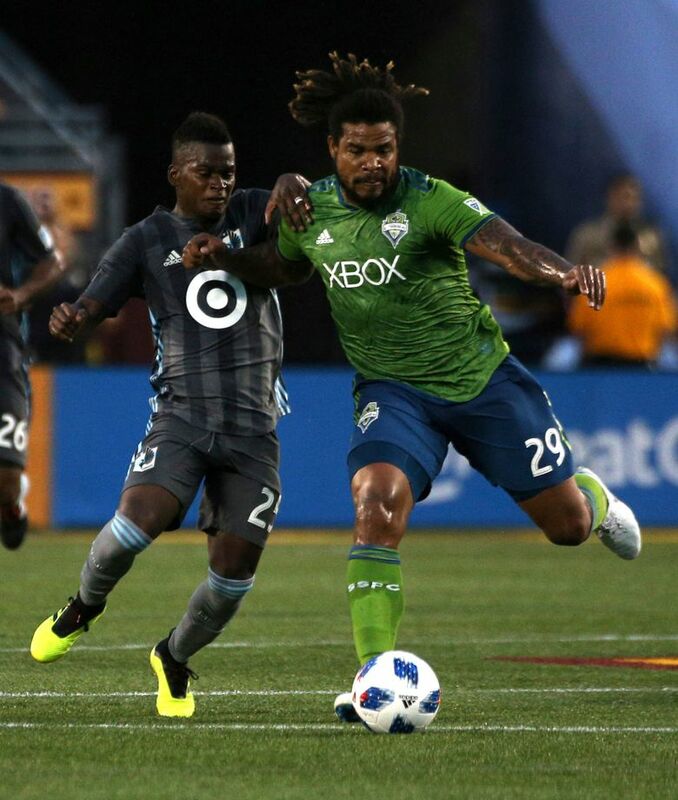 The Seattle Sounders kept their playoff hopes alive, coming from a goal down in stoppage time to win 2-1 over Minnesota United. 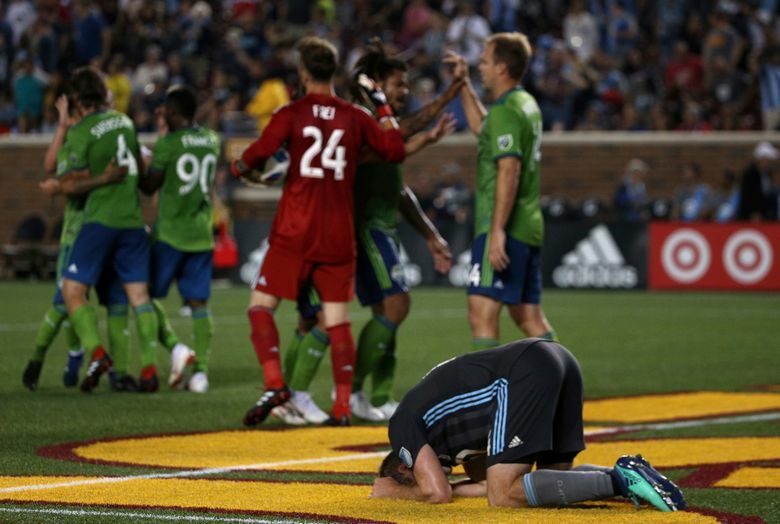 MINNEAPOLIS — Nicolas Lodeiro and Will Bruin scored stoppage-time goals to give the Seattle Sounders a 2-1 victory over Minnesota United on Saturday night. 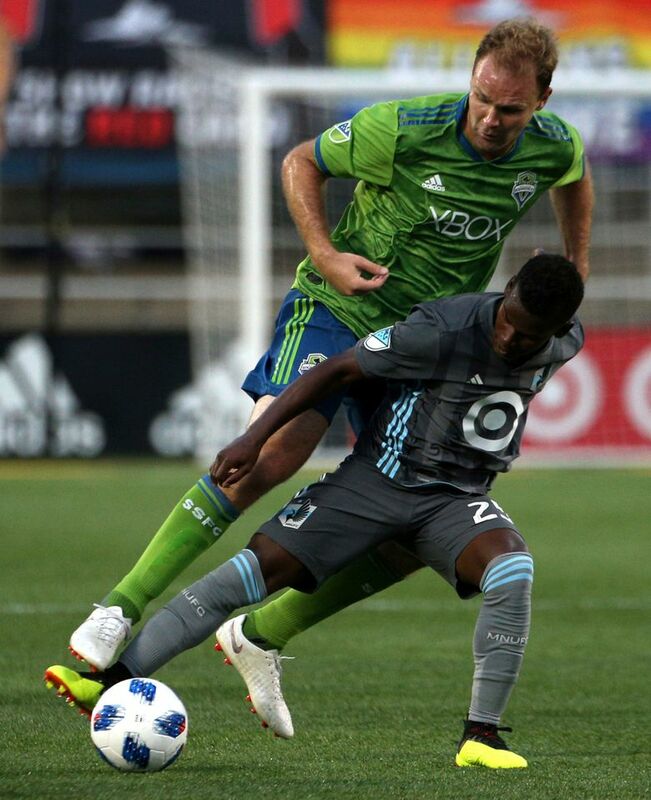 After Minnesota United’s Miguel Ibarra was called for a handball, Lodeiro converted from the spot to tie it for the Sounders (8-9-5) in the 91st minute. Bruin then added the winner in the seventh minute of stoppage time by chipping home a headed through shot from Raul Ruidiaz to beat the onrushing goalkeeper for Seattle’s fourth win in a row. The Sounders have a seven-game unbeaten streak (5-0-2) and climbed past Minnesota and Houston in the Western Conference standings with 29 points (Minnesota has 28 and Houston has 27). Darwin Quintero opened the scoring for Minnesota United (9-13-1) in the 19th minute. He spun around Harry Shipp and faked right to get Chad Marshall leaning the wrong way before sending a left-footed shot just inside the far post. Sounders defender Kim Kee-hee left the game in the 38th minute with a leg injury. Continuing this run will be a challenging task for Seattle. The Sounders host Western Conference-leading FC Dallas at CenturyLink Field next Sunday. Oscar Pareja’s men haven’t been getting as much attention nationally as Atlanta United, but they’re quietly putting up a sterling season with a 12-3-6 record to give them 42 points from their 21 matches. After that, it’s another home matchup against Western Conference foe L.A. Galaxy, who are in the thick of the playoff race under former Sounders coach Sigi Schmid.